GFAR Executive Secretary Mark Holderness was invited and sponsored to present a paper on ‘Collective Action, the future for Agricultural Research and Innovation’ to the 2nd International Conference on Agricultural Research, held on 24-29 September in Beijing, China. The Conference was organized by Partner in GFAR, the Chinese Academy of Agricultural Sciences (CAAS). 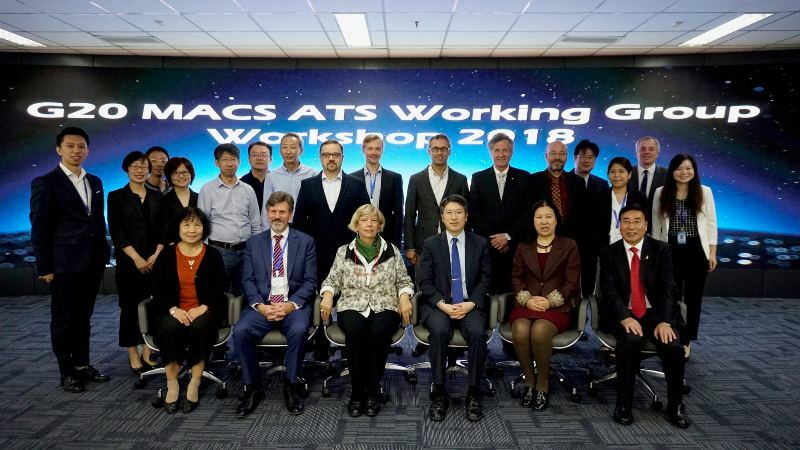 The mission also included participation in the working group for the G20 MACS Agricultural Technology System and the development of the China-Africa Technology Transfer Consortium. The CAAS Conference on international agricultural research was attended by 350 participants and provided an important showcase for Chinese agricultural research and its international implications, as well as highlighting new policies emerging as China’s international role as a South-South provider of knowledge evolves. Prof. Wu Kungming, CAAS Vice-President and other senior national officials from the Ministry of Commerce, emphasized the changing role of China and the significance of the Belt & Road Initiative. They emphasized the processes by which China was working to help share its experiences and technologies for small-farmer systems, extending the Belt & Road principles into Africa, through South-South partnership and knowledge transfer. China is making 500 senior agricultural experts available to Africa in 2019-2021, to enhance agricultural production via Chinese technologies, making use of Chinese technologies such as GM cotton, vaccines, hybrid rice etc. Dr Gong Xifeng, director of international cooperation in CAAS highlighted that the Belt & Road Initiative now addresses agricultural cooperation in 6 countries in Central Asia, 11 in SE Asia and 16 in WANA, in each case working with crops and systems that are particularly relevant to the region concerned. Central Asia will be a particular focus in 2019. China is also now sharing technologies through joint laboratories in countries such as Indonesia (bird flu vaccine plant) and Cotton in Central Asia (Uzbekistan). The CAAS graduate school is recruiting 300 overseas students per year. Through the CIARD initiative, the GFAR network and FAO have provided much past support to CAAS in the development of its information & communication capabilities, which are now very advanced. Dr Sun Tan of CIAR set out the scale of the Foreign Agriculture Cooperation Public Information Service Platform developed by the institute, which now contains more than 3 million literature items and upward of 1 million extracted data items – country profiles etc.– covering more than 100 countries. The system monitors the websites of agricultural institutions networks and domestic websites, enabling Chinese businesses to find partners worldwide (www.facisp.cn). Chinese private sector investment is also now a feature, particularly into SE Asia and Russia, with many joint ventures and mergers and acquisitions involved. As well as international outreach, the revitalization of rural areas in China is now also a key policy initiative of the Government of China. Over 50% of Chinese agricultural production can now be attributed to science and technology. Coverage by improved varieties of major crops is now 96% of production. A major shift has been the establishment of farmer cooperatives in 2007 – to date there are around 3 million farmer cooperatives now established, a major change away from the former commune system. Strengthening innovation driven by science and technology to promote high level development of modern agriculture is seen as a key underpinning for the revitalization of rural China, itself requiring new approaches to ensure agricultural technologies are appropriate and effective for rural development. Mark Holderness, GFAR Executive Secretary, gave an invited presentation on Collective Action and its vital role in agricultural research and innovation. The paper described the complex reality of innovation webs, yet also the power of inclusive, integrated innovation cycles in breaking down barriers between sectors and institutions, to deliver coordinated actions for development impacts at scale. He highlighted key areas where collective actions are required to be real game-changers, as identified by the 600 partner organizations in GFAR: putting farmers and communities at the centre of innovation; turning knowledge and innovation into opportunity and enterprise; transforming institutions and empowering youth and women and strengthening knowledge management and joint advocacy to show the impact of agricultural innovation in development, recognizing also that to get there we all need better learning and outcomes of what is required to make multi-stakeholder partnerships most effective. Yemi Akinbamijo, Executive Director of the Forum for Agricultural Research in Africa (FARA), summarized the challenges facing African agriculture, including, among others, low productivity, high food import bills and a huge science deficit and outmigration of talent in the system, as well as being severely challenged by climate change. The potential of China to help meet scientific needs is well recognized, and addressed under the FOCAC Forum on China Africa Cooperation (FOCAC) policy framework, to facilitate technology transfer and capacity development to benefit Africa. Kristin Davis of IFPRI highlighted the need to develop new capacities in extension, going beyond production alone and considering well rounded technicians who act as brokers to diverse services. She also cautioned against reliance on new communication technologies alone, seeing a future for pluralistic, public private partnerships and entrepreneurship opportunities for the youth. This required an emphasis on demand driven services, accountable to their clients and within the broader innovation framework described by Mark Holderness. Mechanization and wider take up of Chinese machinery is another area of outreach, both inside China (due to rising labour costs) and internationally. Chinese equipment manufacturers pointed out that this was not just a matter of selling machinery; as in other areas, unless this is integrated with full after-sales service and maintenance provision, and in many cases purchase financing, then uptake will not be there – innovative technologies are not sufficient by themselves. The G20 Meeting of Agriculture Chief Scientists has established a working group to refine and develop the concept of an Agricultural Technology Sharing (ATS) – a widely searchable knowledge-sharing platform and database of agricultural technologies, and their integration, that can provide ready access in support of agricultural development around the world. A working model has been developed for this, as a user-friendly integrated technology informational platform for smallholders and entrepreneurs. Purposes of the system are: i. To enable differently constructed sources of information to be seamlessly integrated and hence cross-searchable ii. To enable a directory of shared information collated by partner organizations iii. Countries and organizations themselves collate and store the information in each country, retaining all rights to the information and are simply sharing their information iv. Consolidated standards and technical mechanisms enable sharing. A draft layout has already been prepared and was presented. This is a significant undertaking and there are a number of barriers to developing such a system, both technically – in interoperability of systems and in trust and validation systems around the information made available. In his talk to the meeting, Mark Holderness summarized GFAR’s earlier roles in open data, with key implementing partners such as FAO, CIRAD and CTA, including collective action towards Coherence in Information for Agricultural Research for Development (CIARD), capacity development & training workshops with CAAS and many others and the establishment of the CIARD-RING to foster database interoperability. More recently, key actions have included the co-development of the Global Open Data for Agriculture & Nutrition (GODAN), hosting of Tapipedia – as the common repository for the TAP-CDAIS programme (on which Karin Nichterlein of FAO gave a separate presentation to the meeting), cataloguing of climate change institutional capabilities in Europe and the Agri-Profiles (Agri-Vivo) database of individual research capabilities. In 2018, GFAR has mobilized collective action on the ethics/principles of open data sourcing and ensuring its use truly benefits smallholders. Mark highlighted the big concerns in data sharing: Power and Trust: Who owns? Who controls? Who can access? Who benefits? and Who is left behind? These questions helped frame the further discussion and planning of next steps towards the ATS, which the meeting addressed well, towards a more thematically-focused and deliverableproposal. With China’s growing international role, Africa is seen as an important focus for outreach and sharing of Chinese agricultural technologies. Though a meeting led by CAAS (CAAS Centre for International Agricultural Research) and the Chinese International Development Cooperation Agency, building on a concept articulated by IFPRI, GFAR, FARA and AGRA were invited to engage in a workshop to help shape the form and approach of such a programme. Elements include provision of 500 senior agricultural experts to Africa as well as support to local production systems for the technologies concerned. GFAR is seen as an important inter-regional linkage and learning mechanism for the proposed programme, while FARA and AGRA will have valuable roles in regional coordination; Yemi Akinbamijo, FARA Executive Director, spoke about African regional commitments to agriculture, notably the Malabo Declaration, links with the Agenda for African Agricultural Science and lessons from other inter-regional linkages. Mark Holderness raised a number of issues for consideration in the planning process, including the value of GFAR’s multi-stakeholder approach in supporting, mentoring and mobilizing demand; in foresight and establishing real community demand for technologies, based on the futures desired by communities of different scales and systems; the need for a holistic, integrated approach to value chains that both integrates actions and ensures the poorest are not left behind; and the need for multi-stakeholder innovation platforms that could make use of appropriate technologies within a wider framer of innovation, uptake transformation and use. These points were well received and Chinese representatives recognized the importance of stakeholder dialogue in ensuring technologies really addressed real needs and in fostering mechanisms and processes required to enhance technology uptake. They also recognized the need for findings from this inter-regional platform to also be able to inform policy processes, recognizing also that over 50 countries are involved, each with its own needs and perspectives. Following the meetings, Mark Holderness was invited to stay on and discuss specific GFAR-CAAS linkages, building on extensive past collaborations, CAAS’ East Asia representative role in GFAR, and the new Medium Term Plan of GFAR, towards a formal agreement to foster further collaboration.